The Irish government is to press ahead with a referendum on extending presidential voting rights to citizens living outside the State, Taoiseach Enda Kenny has confirmed. At the start of his annual St Patrick's trip to the United States, Mr Kenny outlined plans for a public vote on what was a key recommendation made by members of a constitutional convention four years ago. If the change to the Constitution is approved, voting rights would be extended to Irish citizens worldwide, perhaps most notably those living in Northern Ireland. The referendum is unlikely to be held in time to affect next year's presidential election. Any changes would therefore come into operation for the 2025 vote. In a speech at an Irish Famine memorial in Philadelphia, Mr Kenny said a detailed government options paper would be published later this month. "Today's announcement is a profound recognition of the importance that Ireland attaches to all of our citizens, wherever they may be," he said. "It is an opportunity for us to make our country stronger by allowing all of our citizens resident outside the State, including our emigrants, to vote in future presidential elections. "I am especially pleased to be making this announcement as we prepare for our worldwide celebration of St Patrick's Day and of all that is Irish." Earlier, Mr Kenny took part in a colourful St Patrick's parade in Philadelphia. The Taoiseach is on his final major foreign tour before he is due to announce his retirement plans. The Convention On The Constitution brings together Irish citizens and parliamentarians to debate potential changes to the State's legal framework and make recommendations to government. The forum previously recommended the introduction of gay marriage - a move that was endorsed in a historic referendum. Mr Kenny said extending the franchise in presidential elections gave rise to a range of "legal, policy and practical issues". He said in order to have an informed public debate, the forthcoming government paper would set out the range of options available to give effect to the convention's recommendation. On Saturday night, in his first engagement stateside, Mr Kenny vowed to press President Donald Trump to help the country's thousands of "undocumented" Irish. Highlighting the case of the estimated 50,000 Irish who reside in the United States illegally, the Taoiseach said those "living in the shadows" harboured a strong desire to remain and continue to contribute to society. Addressing an Irish American dinner in Philadelphia, the Fine Gael leader said the "plight" of the undocumented would be an "absolute priority" in his planned engagements with the administration in Washington. During his speech at the 246th annual Friendly Sons Of St Patrick event, the Taoiseach also expressed hope that Ireland's economic links with the US would be strengthened, not weakened, under the new president. 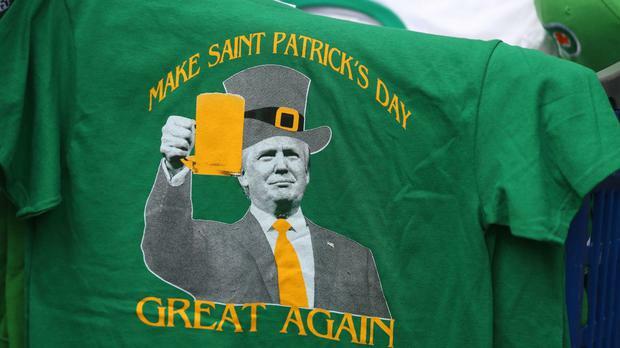 With such worldwide focus on Mr Trump's controversial immigration policies, Mr Kenny's efforts to lobby the president on behalf of the "undocumented" Irish will draw intense scrutiny in the coming week. Mr Kenny said holding a referendum on the issue in 2018 was a "realistic" possibility. He said he envisaged overseas citizens being able to vote online. "If you take a welder in Alaska or a farm worker in Queensland, Australia, they may not be in a position to travel to an individual centre so we will have to explore all of the opportunities that exist here," he added. The Taoiseach said the striking memorial on the waterside in Philadelphia was an apt setting to announce a move aimed at allowing Ireland's wide diaspora to play a more active role in their homeland. "I do think it will be something that Irish emigrants or their descendants will be very happy to be associated with and to have the option, and hopefully the opportunity, to cast their votes for whoever the candidates are in the presidential election in 2025 or afterwards," he said. Mr Kenny added: "I hope this will be well received by Irish people all over the world." Mr Kenny later attended a lively Irish American community party in the city. In reference to the undocumented, he told an enthusiastic audience inside the Old Pine Community Centre that Ireland stood with the diaspora when it came to the immigration question. The Taoiseach acknowledged there were "concerns and challenges and legitimate anxieties". He said it was now important for various Irish American groups to work together. "What we need to do over the next period is to draw those threads together and make the case to the administration of how these people are friends of the United States," he said. The event was part organised by local GAA clubs from Philadelphia. Mr Kenny paid tribute to their work. "The Gaelic Athletic Association is practically the best example of a global sports organisation that you could find and the reason for that is that the jersey fits everybody - every boy, girl, man, woman, irrespective of your race, your religion, your creed or your economic status - the jersey will fit everybody."